NICL National Insurance Company Limited Agriculture Apprentices Recruitment 2017/ NICL National Insurance Company Limited Agriculture Apprenticeship Posts 2017 Recruitment: National Insurance Company Limited (NICL) invited online applications for Agriculture Apprentices. NICL is offering full time apprenticeship for two years. Applications are invited for filling up 25 vacancies for a term of maximum two years. The last date for submission of applications is 8 January 2018. For the first year selected candidates will receive Rs. 40000 per month and Rs. 45000 per month. Applicants must be in the age group of 21-30 years (3 years relaxation for OBC candidate and 5 Years Relaxation for SC/ ST). 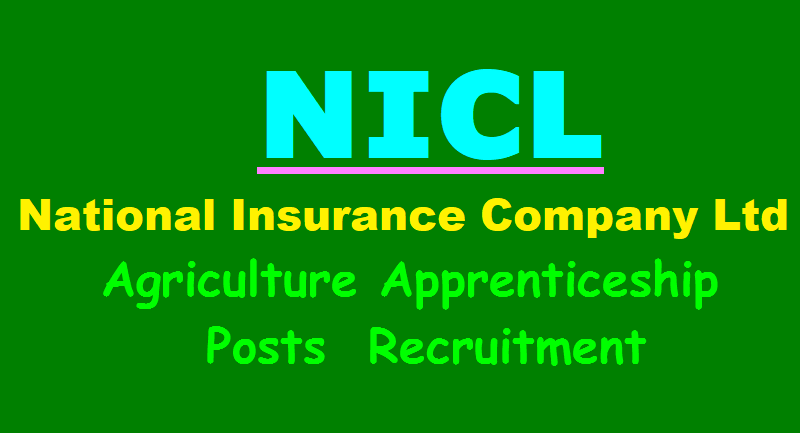 Detailed Agriculture Apprenticeship job advertisement is available on the official website nationalinsuranceindia.nic.co.in. 'Graduate in Agriculture Science/ Agriculture Engineering/ Forestry/ Horticulture/ or equivalent from a UGC recognised University with at least 60% marks in either of the degree or post-graduation examination for General and OBC candidates and at least 55% marks for SC/ST candidates,' are eligible to apply for the apprenticeship. Age: As on 01-12-2017 : Minimum 21 years (completed) and not more than 30 years forGeneral candidates. Candidates shall have to apply in the prescribed format and send the completed application to the Chief Manager (Pers) National Insurance Co Ltd Head Office, 3 Middleton Street Kolkata - 700 071. NICL will select candidates on the screening and shortlisting of application and personal interview. Upon selection, candidates will be posted at Head Office of National Insurance Co. Ltd. at Kolkata and/ or any of its Regional Offices and/ or any office anywhere in India. 'Company will display the list of shortlisted candidates on its website. Candidates are advised to visit the same at regular interval. No TA/ DA would be paid to the candidates shortlisted for Interview. Interview may be conducted at the Head Office of the Company at Kolkata and/ or any other Major Centre,' reads the official job notification.